GeneO – give your skin brightness in 20 minutes! Do you know GeneO, so in other words, the exfoliation – oxygenation – absorption? If not, calm down, we will tell you what it is and why women fell in love with this innovative treatment. Geneo is very fast cosmetic and skin care treatment as it lasts only 20 minutes. Recommended for all skin types and all facial areas. Its advantage is the fact that we can use it throughout the year. However, it is recommended in the pre-spring period, to prepare the face for the coming spring. You must remember that you will no longer be covering your beautiful face with a hat or scarf. Spring is a period of airy trench coats and colorful dresses, so your face skin must be bright and deeply oxygenated. Pollogen Company, by inventing this technology, has been inspired by hot springs characterized by oxygenating properties. Geneo consists of three treatments. It is a unique technology which effect has been clinically confirmed. During the treatment, a special head comes into contact with a cocktail and as a result carbon dioxide is created. The treatment area is deoxidized. Then our body delivers a lot of oxygen to this area through blood. At the same time, the blood vessels widen and the cocktail penetrates deep into the skin. All these activities make it possible to arrange an appointment before an important banquet, because the results can be seen after the first visit at a cosmetologist. GeneO comes in two options. We choose one of them depending on our skin needs. The first one is NeoBright, a treatment that will brighten our skin. The effects are a significant lightening of the skin, color balance, reduced visibility of discoloration. The treatment is effective thanks to active ingredients such as azelaic acid, kojic acid, retinol, rosehip extract, hyaluronic acid, vitamin E. The second option is NeoRevive, so the skin nourishment. Thanks to the treatment, our skin is nourished, moistened, revitalized and smoothed. In this case the active ingredients are ribose, retinol, vitamin E, C, wild rose extract, hyaluronic acid. For better results, cosmetologists recommend 4-6 treatments every 2-3 weeks. The treatment will be ideal for people whose skin is dehydrated, are active smokers, have dilated pores, uneven skin tone, slight discoloration or wrinkles. After the GeneO series, you will have a guarantee that your face will look much better, be bright and shine. If you have been wondering what to do to make your skin look better in the spring, then you should consider GeneO. 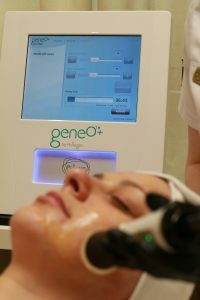 With GeneO, you are sure that after the first treatment you will see incredible results. Do not hesitate; make an appointment at Dr Legrand Clinic. Thanks to the skin tester, we will prove you how much the GeneO treatment affected your complexion!